JD Sign Company has provided innovative signs for a wide array of customers. Businesses we have helped to establish their image vary from restaurants, builders, accounting firms, farm markets, and large events such as the Delaware State Fair. We can help you too! Give us a call today to get started on making your business stand out with an expertly executed project from JD Sign Company. JD Sign Company Specializes in Custom Signs, Lighted Signs, Digital Message Signs, Routed Signs, Channel Letters, Awnings, Sign Maintenance and Repair, Banners, Digital Printing, Emergency Vehicle Lettering, Fleet Graphics, Permitting, Site Surveys and Vehicle Wraps. 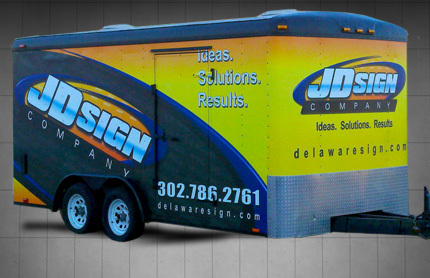 When it comes to diversity, quality, professionalism and experience, JD Sign Company stands out from the rest. It's what customers for years have depended on and still do. Serving Dover, Harrington, Rehoboth, Georgetown, Middletown, Newark and all surrounding areas of Delaware, Including Maryland's Eastern Shore.